The first thing I noticed was severe VCO instability on the BOG. I was told that LFO bleed usually is the culprit (it is, but not alone in my situation). Then I noticed that I get severe bleed from the SWAMP's Digital Noise into the BOG as well. And then I finally realized that the power supply is defective. So I'll have that fixed or replaced. In the meantime I connected a Eurorack power supply to power just the BOG. The VCOs are more stable now, but the LFOs still do bleed into them enough to make tuning impossible. When I connect the SWAMP too, the Digital Noise also bleeds again and everything just warbles around. Coming from Eurorack and a little 5U, this seems really crazy. I know that those systems can have issues with bleed as well, but with the many different PSUs and distribution systems I've used so far, I've never had any issues. Do I just have a subpar Serge build or is this normal and nobody really talks too much about it? Sorry for the ranting ... 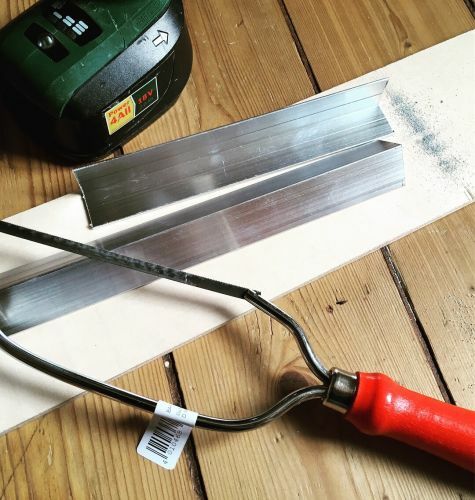 I thought that getting into Serge would be easier, with my extensive Eurorack knowledge and some DIY experience. It's very hard to find any information, probably because everybody just builds their own thing and it's such a tiny market? Thanks a lot for the replies, everyone! I rewired my Eurorack PSU (making sure to connect ground to 0V this time), rewired the distribution board, untangled the power cables inside the BOG, cut some zip ties and rearranged the power distribution in there as well. Lo and behold: it's working now!!! Got solid pitch on the VCOs, DUSGs and LFOs, very little bleed (that I can totally live with) and no interference from the SWAMP's random module any more either. I can't believe it! Just an FYI, because I haven't found a good answer on Google regarding how much mA the Serge panels consume. I measured mine with a multimeter and came to the following results, which I rounded up to the next 10mA. Of course, those values depend on how the panels are actually built and are not universally applicable to others. For me this means that the big and heavy power supply which I bought with the panels (and which I will have repaired soon hopefully), is really not necessary and I might just get another one of those Meanwell RT-65B PSUs for less than 30€ which I'm currently using. I haven't had any issues with this one and it provides +12V 2.8A and -12V 0.5A. 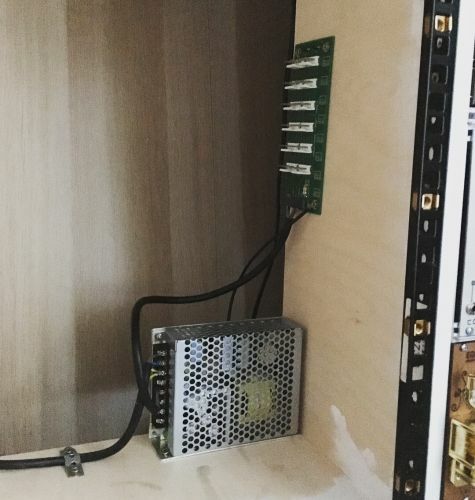 - poor PSU - what design is it? The BOG is known for this fault. The CGS LFO design injects current fluctuations into the power lines. (1) Some builders live with it. (2) Others use two power inlets to 'solve' the problem (the VCOs get their power from one inlet, everything else gets powered from the other inlet). I 'solved' the problem by taking the 2nd approach, but using a single power inlet and splitting the power lines inside the boat. The VCOs are powered from one line, everything else is powered from the other line. I used thick cables for power (probably 16 gauge, maybe thicker). The bleed is almost unnoticeable. EDIT: if you decide to go with dedicated VCO power, and your BOG uses those long, thin CGS power rail PCBs, then you will need to physically cut the 3 power rail tracks on the PCB to ensure that the VCOs are definitely isolated from the other modules. And yes, don't zip-tie wires together - leave them loose and live with the mess. As someone else said hereabouts, loose wiring is quiet wiring. Braided power wires are okay. Definitely not a “Serge” thing. My 3 STS panels have no bleed or instability issues. Not, it's not a Serge thing. It is down to the design of some CGS modules and the abilities of each builder to eradicate problems as they show up. Ken Stone is very good at offering help but, in fairness, his CGS module build notes assume a goodly level of synth DIY experience. The bleed is from the long wires in the power distribution and less than optimal VCO design. As drip.feed said, route separate power wires from VCOs to the power source. It is the IR (current-resistance) drop across the shared power lines causing the issue. Braiding or bundling power wire will cause very little bleed. I have a video on this issue on youtube, oriented towards eurorack systems but applicable for any modular power set up. Serge power distribution leaves a lot to be desired, but it is not hard to improve. Shorten the long wires and remove pcb distribution, then fit a central busbar distribution and ground the 0V busbar. If used with other systems connect the 0Vs with Dinse connectors, the use of a banana jack on a PSU for this purpose should be deprecated. Nice patch!! Glad to hear you got it straightened out! What a thread! It started out seeming like a slightly sad story of a poorly built BOG/SWAMP that was going to be trouble and finished up with everything working, that great video from Felix, and Graham's amazing picture of probably the best specified Serge power supply and distribution that has ever been constructed. Pics of Graham’s power solutions will improve any thread. Thank you, Graham. I read a lot of your previous posts in the past couple of days (a suggestion by the bad producer) and it has been really enlightening That power distribution looks amazing! I read a lot of your previous posts in the past couple of days (a suggestion by the bad producer) and it has been really enlightening That power distribution looks amazing! Well you seem to have worked out most of it on your own, well done! 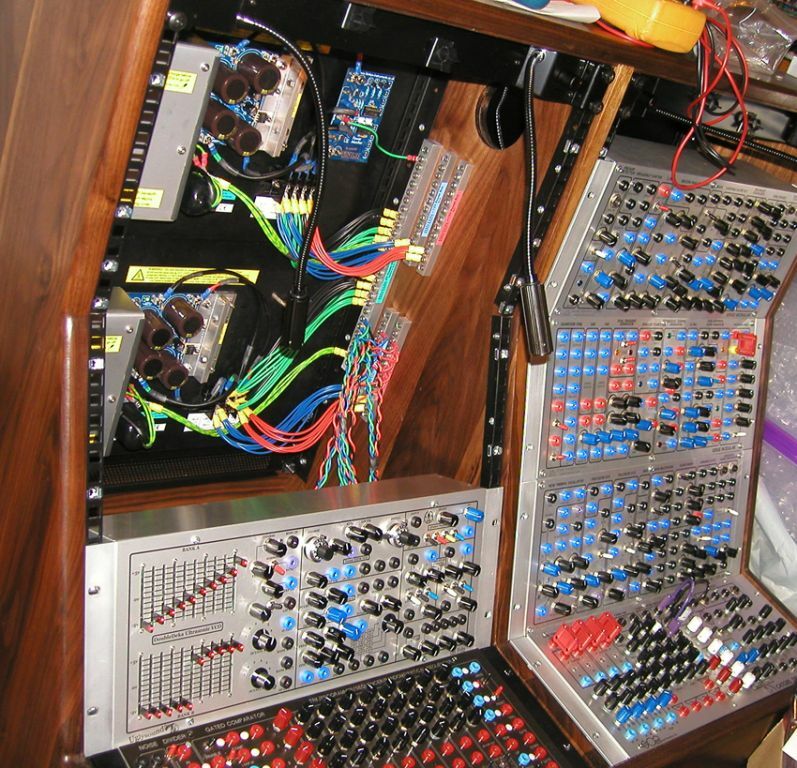 Most modular systems have been plagued by power distribution problems since the first Moog modular. You mentioned some LFO bleedthrough. Check that the LFO is not sharing a power cable with another module, if it is try to separate them. If you can hear any crosstalk at all it needs to be reduced by about 20dB and that means identifying the wiring where it occurs and decreasing its resistance by a factor of ten. You can't get enough copper on pcbs to achieve that which is why you see the large busbars. This is quite a simple solution, it just doesn't lend itself to being sold in cardboard boxes by retailers. 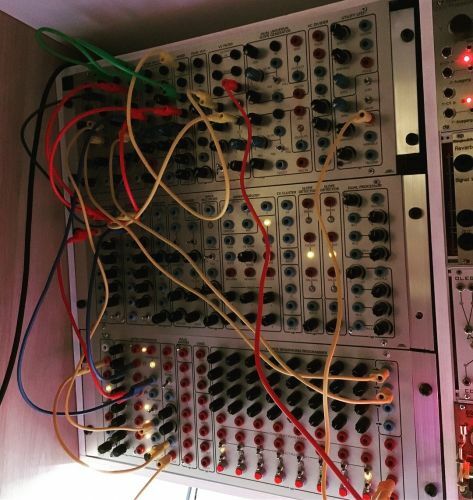 The Serge system in the picture belongs in Darkest Avalon studio where it has Buchla, Wiard, Euro and Emu systems for company. All are connected together with a ZeroVolt busbar which provides a common reference so that they may all be freely crosspatched. Before that went in nothing could be crosspatched without ac hum modulation and half the Serge system was powered from a Power One that you could hear buzzing the other side of the room. 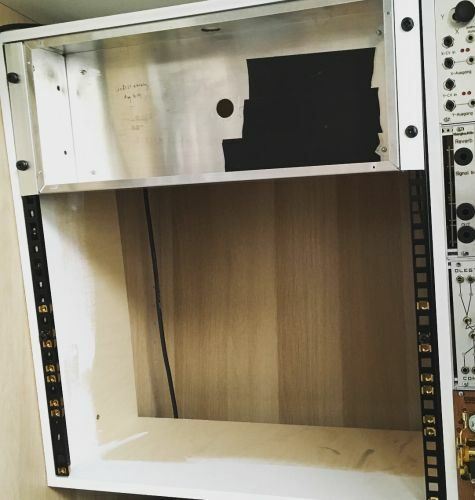 I built myself some 19" rack ears from a 5€ aluminum L profile today. Not my best DIY job, but it works for now. I also installed a Meanwell RT-65B PSU which I mentioned above and which still does its job without issues. remove pcb distribution, then fit a central busbar distribution and ground the 0V busbar. I'm wondering what you mean by this.. remove pcb distribution.. are these CGS MOTM power distro boards with a bunch of MTA-156 connectors a bad idea as far as noise is concerned? I am talking about inside a case that contains a bunch of serge format modules..
also, i see that the power cables here: http://www.hinton-instruments.co.uk/paprod/modular/accessories/index.h tm are not twisted. Is there any noise reduction benefit/harm in twisting power cables? PCB power distribution is a bad idea that has propagated through all formats by copying without thinking. They can be easily made on a kitchen table and sold by box shifters, but they are not a good electrical solution just a recipe for common impedance coupling. You cannot get enough copper on a pcb to get the resistance low enough and the more you try the more expensive it becomes and the harder to solder connectors to or repair. also, i see that the power cables here: http://www.hinton-instruments.co.uk/paprod/modular/accessories/index.h tm are not twisted. Look at the picture above again. Is there any noise reduction benefit/harm in twisting power cables? All the theories about twisting cables together so that interference is picked up equally assume that the source is an infinite distance away. In practise it is usually close up and does not pickup equally. It is also pretty hard to induce interference into low impedances. Valve heater power wiring was usually twisted because it was AC and high current and the radiated magnetic fields mostly cancelled. Now it is just style and, like a lot of things in this game, form over function. If you twist wires you need a longer length for the same distance so there is a resistance consideration. Graham, others, is there any value in trying to make all power lines equal distance? Within an inch? 6mm? Don’t bother? Different power cable resistances can set up current flows , wondering if this is something we should put on the power supply best practices list? No, don't bother. Keep them all as short as possible. Not according to Herr Ohm. Different current draws set up different voltages in the different cable resistances. So minimising the resistances makes the voltage differences as small as possible. You cannot get zero resistance, but you can make vast improvements over what most systems pass off as power distribution. These things are always relative, but if you can hear a problem it needs to go down at least 20dB and that means find where the problem is caused and make that wiring at least ten times thicker! You can measure the voltage drops along power cables under load to get an idea of their resistance. The 0V cables may or may not show the same depending on if the +ve and -ve loads are equal, but the resistance will be similar to a similar piece of power rail cable. If you find drops more than 10mV you need to thicken the cable to reduce it. Thanks a ton for your responses Graham, this is very helpful! What is a good approach to grounding the housing for pots [I assume this is 'chassis ground']? Most modules have pots, and often, a metal face-plates.. though my modules actually use wood panels. I wonder, as far as noise is concerned, if it is beneficial or harmful to connect the pot bodies + metal front panel to the ground a each module or would it be better to not do that and simply connect the case that the modules are put into to a ground and have all the pot bodies and metal face-plates connected to that? I have a banana system so my jacks don't have a ground, but I'm guessing some euro systems end up putting a ground on the face-plate just because of their jacks.. Most modular systems are not correctly grounded for safety or best audio practise. Safety is the overriding consideration. A synthesizer is a Class I appliance and should be connected to Mains Earth because the user can touch the patch cables. Unfortunately most power supplies do not bring the Mains Earth through. Most are floating, if they do connect Earth to 0V it is the wrong place to do it--you can't use a cable carrying current. The way devices are tested for safety is with a Personal Appliance Tester (PAT) which injects 25A (4A for IT equipment) at exposed metal places and measures the voltage from the Mains Earth input. Most modular systems would not pass this test! The correct way to do it is to connect all panels back to the Mains Earth and also separately connect the 0V of the power distribution back to the same point close to the mains inlet. You mean your jacks don't have a screen/shield. Euro and other 3.5mm and 1/4" jack systems usually incorrectly have the jack screens connected to 0V on the module pcbs and the systems that use external power bricks don't usually have a Mains Earth Connection. The best recommended practise is defined by AES48. Jack screens should be connected to chassis ground and if there isn't a chassis to a wire returning to the Mains Earth separately from the power 0V. The aim is to create a equipotential surface covering the entire system like a skin. It is only connected to Earth at one place in any device. Think of a cable screen like a tubular extension between two chassis. Signal currents should not flow through cable screens, that would stop it being a screen or an equipotential, which means that another path has to be provided. In a banana system the signal return currents are all through the power supply 0V, in other systems they split according to the resistances of the parallel paths they see. The lack of understanding and implementation of this simple basic principle is what causes problems commonly attributed to "ground loops". okay, so keep the module face plates/pot bodies disconnected from the 0v at the module and let the case do the work connecting the pot bodies/faceplate to the mains earth connection. yeah, that is what i meant. okay! Once again, thanks tons Graham!